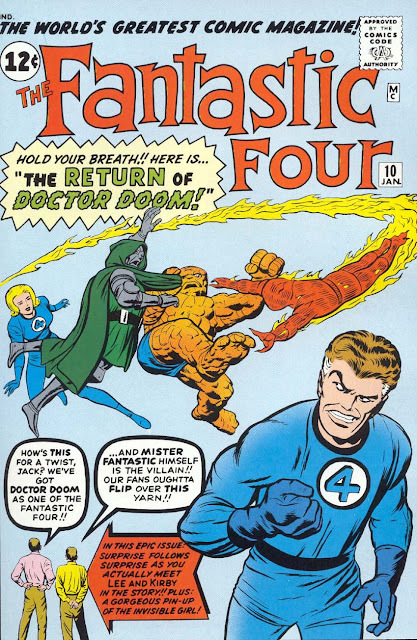 It's the FF's tenth issue, and - Doom's back! (Okay, it's only been four months.) When last we saw him, Doctor Doom had betrayed Namor, the Sub-Mariner, in an attempt to get rid of both Subby and the FF, and had been sent flying off into the dark reaches of outer space for his reward. There, we discover, he was rescued by a race of peaceful egg-headed aliens called the Ovoids, who happily took him in and taught him a number of their mental feats - such as that of mental transference. Once back on Earth, he lures Mr. Fantastic into a trap and then uses this trick to switch bodies with Reed! or Doctor Doom flying through space on that rock. pathos of the scene above. It really should, but it doesn't. What's most interesting, then, is thinking of the culmination of Doom's plan and what it implies. Having left Reed (in Doom's body) to perish back at his castle, and set into motion a scheme to shrink the other three members of the FF down into nothingness, Doom would then be left with his own mind in Reed's body, and the world none the wiser. This is especially fascinating because it so perfectly fits the traits often seen in an archnemesis: the obsession with his enemy, often to the point of fanaticism, yet with undeniable hints of jealousy as well. 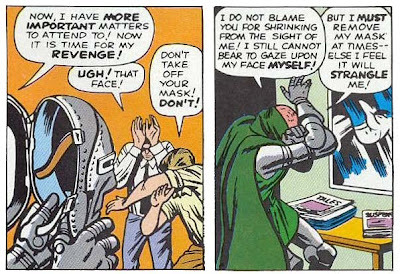 Were Doom's plan to succeed, he would have not only defeated his opposite number - he would in fact have become him! Clearly, Jungians could have a field day here. needing only two panels of the issue to do so. Tiny animals. 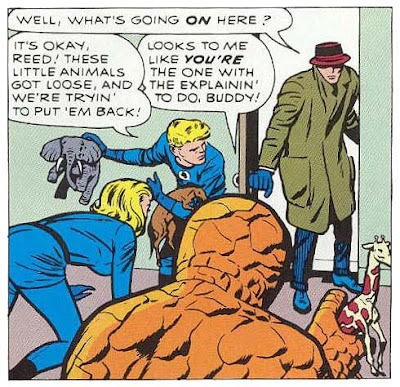 On top of everything else in this comic, we get tiny animals! This really is what makes these comics such a treat.